Whenever I see the wildflowers growing among the barbed wire, it always gets my attention. The contrast of the beauty of the flower versus the harshness of the barbs... well, it just tells a story or makes a statement. That's my opinion anyway. I decided to get a little creative this morning. Well, actually it wasn't a conscious decision. I was cropping and resizing the original photo, when this little voice in my head started saying "Pssst... sepia. Hey, I bet this might look good in sepia. Try sepia. I'm tellin' ya... S.E.P.I.A.!" Geesh - So I tried it out in sepia just to get that voice to shut up already; it was givin' me a headache! What? You don't have voices telling you what to try on your art? Then, ummmm... please disregard the majority of this paragraph. Never happened. Honest! HI Misty...voices in your head can be good and not so good ...just don't tell anyone about the not so good lol!! Yes I love your photo, both ways,and the subject is perfect!! 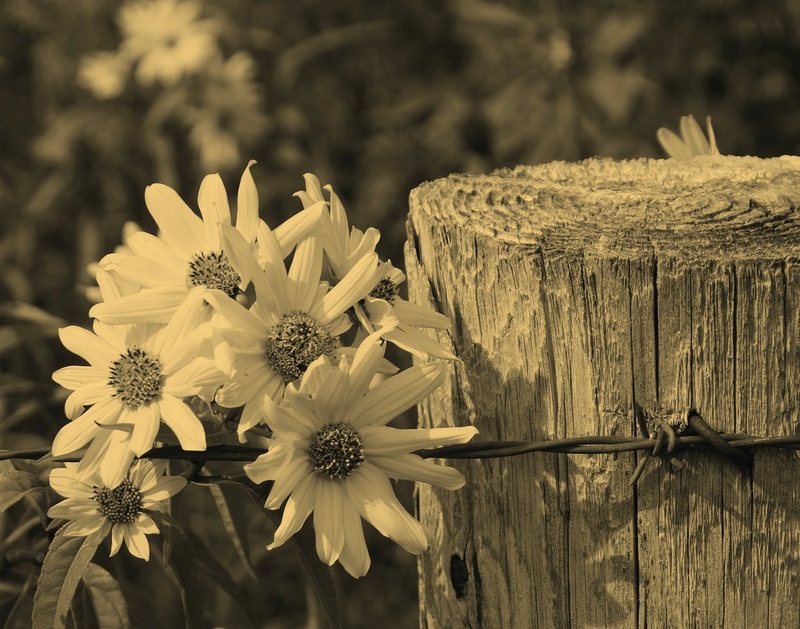 I always hope the barbed wire doesn't injure the flowers. Does that rate right up (or down) there with little voices? Anyway, whoever decided to try sepia did have a good idea. It looks lovely. But better than the original? Hard to choose. Love the sepia version of this shot! So glad you listened to that little voice Misty. The sepia color turns out very beautiful!